Costa Rica National Parks: Our Favorites & What To Do There — Sapphire & Elm Travel Co.
Come on, take a guess. There are 27 National Parks in Costa Rica. Not bad for a country that's 19,700 sq mi (51,100 square km), ranking it 129th in land mass in the WORLD. That's roughly the size of West Virginia (USA) or Denmark! Don't let this small nation fool you. Costa Rica is home to a variety of landscapes; rolling mountains, rainforests, jungle, rivers, volcanoes, lakes, open plains, desert, and lush valleys. In fact with over over 615 wildlife species per 10,000 sq km, Costa Rica sits atop of the list as the most bio-diverse region of the world! This year Sapphire & Elm co-founder Stephanie spent three weeks in Costa Rica, and was able to visit a few of the countries' National Parks! Arenal Volcano National Park is probably the most famous National Park in Costa Rica, named after the active volcano. Arenal volcano is 5,358 feet (1,633 meters) tall and its' perfectly symmetrical shape makes it a sightseer’s dream. There's no mistaking this volcano for your average mountain! Arenal volcano is considered to be a young volcano, as it's estimated to be less than 7,500 years old. The volcano was dormant for years, then erupted in 1968 over the town of Tabacón. Since 2010, Arenal volcano has been dormant. Arenal volcano in the national park is one of the most recognized places in Costa Rica, and a can't miss activity! Whether it's hiking the base, enjoy a hot spring or simply staring at the volcano from anywhere in town. La Fortuna waterfall is located just next to Arenal Volcano National Park. Upon entry, you must climb down over 400 steps to the base of the waterfall where you can swim in the powerful falls! The beautiful and powerful Balsa river flows around La Fortuna. For a thrilling day for the whole family, go river rafting! The area of Arenal National Park/La Fortuna is known for it's hot springs! Many hot springs are located at hotels, some are better and more natural looking than others. There's even a free one across the street from Tabacón called Tabacónito. It's located under the bridge, enter through the yellow gates. There are so many options for hot springs, contact us to help you pick the best option! Tourists used to be able to hike to the top of the volcano, but after many incidents of injury and death due to ash, falling cylinders and toxic fumes, in 1998 an exclusion zone was enforced. Now you can hike only around the base of the volcano. There are many beautiful trails here that vary in length and difficulty. For a calm walk around the lush nature of Costa Rica, take a 2 mile (3.2 km) stroll on the Mistico hanging bridges which features 6 hanging bridges in addition to 10 regular bridges. Manuel Antonio National Park was listed by Forbes in 2011 among the world's 12 most beautiful national parks. It is also the country's smallest National Park at only 1,983 land hectares or 7.6 square miles! The national park is located just south of the town of Quepos. You can find accommodations here, or two other towns closer to the park. There are many hiking trails you can take, all of which are easy to moderate. Nothing difficult but some areas are quite sandy or have stairs. This park is known for it's wildlife viewing. It was here that I saw roughly 50 monkeys in one day! Plus several sloths, raccoons, and other animals! TIP: The park offers guided tours to help you spot wildlife, but you will see monkeys, sloths and other wildlife regardless! I recommend the guided tour is you're interested in learning more about the wildlife, not just seeing them. Additionally, they have telescopes to help see animals better or ones hidden from plain site. There are a few stunning beaches here in this park. I recommend going to the second beach called Playa Espadrille Sur which was way less crowded than Manual Antonio beach which you will come to first. TIP: The park is closed on Mondays. 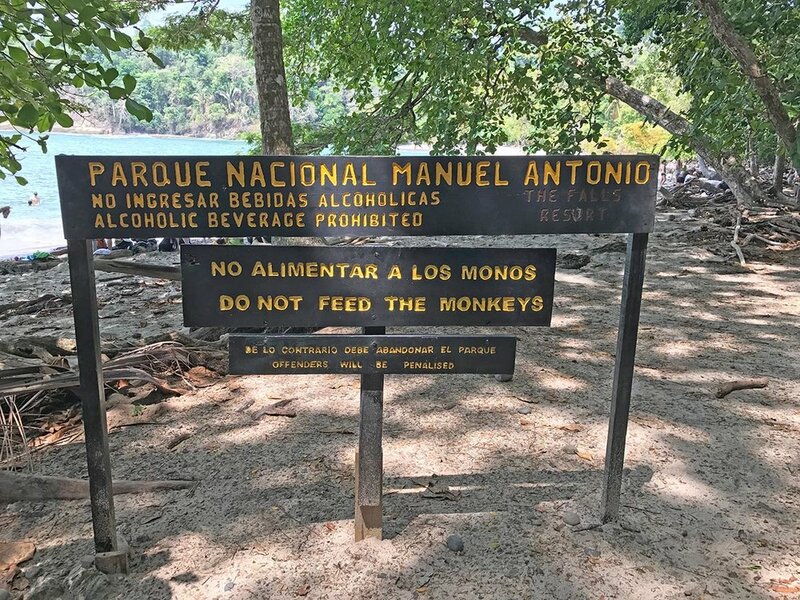 Peak months are December to April, and the park restricts the number of visitors so go in the mornings to ensure you can enter Manual Antonio National Park. Tenorio National Park was one of my absolute favorite national parks to visit in Costa Rica! Tenorio National Park is known for it's bright blue waters created by the mixing of two non-colored rivers. This happens when the pH levels in the mixing point changes the particle size of a mineral present. The Tenorio volcano is considered active, but it's dormant with no eruptions in recent years. Hiking trails in Tenorio Volcano National Park will take you to the Celeste waterfall, suspension bridges and to where the Rio Buenevista and Quebrada Agria rivers meet. TIP: You cannot swim in these waters. Most likely the trails will be muddy so wear hiking boots or you can rent rain boots at the entrance. I didn't get a chance to get into the Tenorio hot springs. If you do get into them be careful of the hot waters and boiling mud pits! Cahuita National Park is both a land and marine national park, located on the Caribbean coast of Costa Rica. It's known for it's hiking trails along the water, snorkeling and wildlife viewing. Cahuita National Park land area covers only 2,732 acres (1,106 ha) since most of the park is actually under water. However, you can walk around the peninsula, as it's roughly 8km. TIP: If you decide to hike around the park, starting at Cahuita town and ending in a different location, the bus stops running early around 5pm and therefore you might not be able to continue if you get a later start or enjoyed the beach for hours in the morning/afternoon. For fish, sea turtle and shipwreck viewing snorkeling is a must! In fact, Cahuita National Park is much more regarded for it's under water portion than land counterpart! Guided snorkeling tours are required. Cahuita National Park has some of the nicest and least developed beaches in Costa Rica. Bring a book, towel, and some snacks and enjoy the non-crowded beach all day! TIP: Cahuita National Park is the only free national park in Costa Rica, but they do ask for donations. Marino Ballena National Park is named after the Humpback whales that migrate through here each year. The park extends from the southern end of Playa Hermosa to the northern end of Playa Piñuela. Wildlife in the park includes: humpback whales, green marine iguanas, bottle nosed and common dolphins, Olive Ridley and Hawksbill turtles, corals, sponges, anemones, lobsters, trunkfish, frigate birds, brown footed boobies, pelicans, ibises. Swim and relax on the large, beautiful beaches. Walk to the Whale Tail. I tried to do this one night and stepped on a bee early on the journey. I had to turn around as I couldn't step on my foot. Make sure to check the tide schedule as it can be dangerous in high tide. Try some water sports like surfing, or spot some amazing fish & coral! TIP: There are two whale migrations. Antarctic families arrive in July and depart in November while their northern cousins from California and Canada come in December and leave in April. There is so much to do in Costa Rica, and your time is both too limited and valuable to be planning all the details on your own. For personal recommendations to create the absolute best and most customized trip for you, Contact Us to plan your vacation to Costa Rica. Corcovado National Park - Located on the Osa Peninsula of southwestern Costa Rica is the most diverse park in Costa Rica. It is the only place in Costa Rica where all four monkeys (howler monkey, capuchin, spider monkey and the squirrel monkey) can be found, all six felines (jaguars, ocelots, pumas, jaguarundi, margays, and little spotted cats) and all four turtles (leatherback, green, olive ridley, and hawksbill)! There are no roads in the park so you have to hike. Isla del Coco National Park - This national park is a UNESCO protected World Heritage island off the coast of Costa Rica. It does not allow inhabiters except for park rangers, making this the largest uninhabited island in the world. You've probably seen the island in notable movies such as Jurassic Park. The underwater portion of the park is often regarded as some of the best diving to see sharks, tuna, rays, dolphins and more. La Amistad International Park - This UNESCO protected World Heritage Site is an International Park because it expands from Costa Rica into Panama. Rincón de la Vieja Volcano National Park - Rincón de la Vieja is the largest and most active volcano in Guanacaste, Costa Rica. It is part of the UNESCO protected World Heritage Site of the Guanacaste Conservation Area. Tortuguero National Park - This national park is one that's best seen by boat. In fact it's one of the only parks where walking or hiking isn't the best way to see it. Navigate the maze of waterways by kayak. This park is one of the absolute best to see turtles!